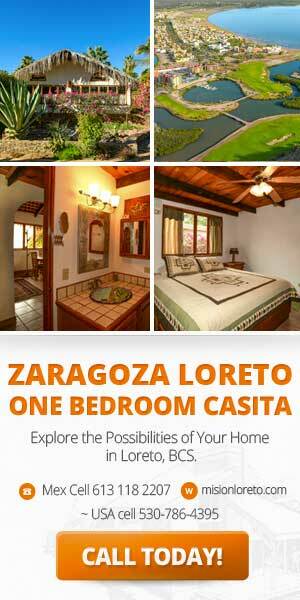 Mision Loreto Properties: Explore the Possibilities! Loreto, Pueblo Mágico: Loreto has natural beauty… the National Marine Park just off shore is comprised of five beautiful islands and the Sea of Cortes is full with dolphins, whales, sea lions, birds and fish. Explore this paradise by boat, kayak or diving. Loreto is a historical town and was the first capital of all of California and the first Jesuit Mission was founded in 1697. Loreto is located 700 miles South of San Diego, California on the the Sea of Cortes, Baja Sur, Mexico. It has an international airport and there are flights directly to Loreto from Los Angeles, Calagary, Tijuana and La Paz, and can be reached by car down Mexico Hwy 1. Loreto Baja Sur is wonderful community and great place to live. Click the following link to learn where to stay in Loreto! Let our experienced team help you find your dream property in Baja! Contact us now. This Is The Moment You Were Waiting For!